This is an article I wrote for our Cornell NY Jefferson County Extension Horticulture Newsletter. ... but maybe the definition of garden should be updated. Habitat loss is identified as a main threat to 85% of all species described in the IUCN's (International Union for Conservation of Nature and Natural Resources or World Conservation Union) Red List (those species officially classified as "Threatened" and "Endangered"). The new garden is perhaps a result of the increasing loss of habitat due to destruction (direct destruction of habitat), fragmentation (habitat fragmented by roads, development, damns and/or water diversions), or degradation (pollution, invasive species) as described by the National Wildlife Federation. Our inherent way of thinking is that "nature is out there" in our wild, state and national parks, in the country, in the woods. This is not necessarily so as development increases and habits decrease. Nature is becoming more frequently forced to live right beside us. The new garden is important. It enables us to do something to help sustain life on our planet. Our new gardens offer a network of habitats that defragment habit loss. 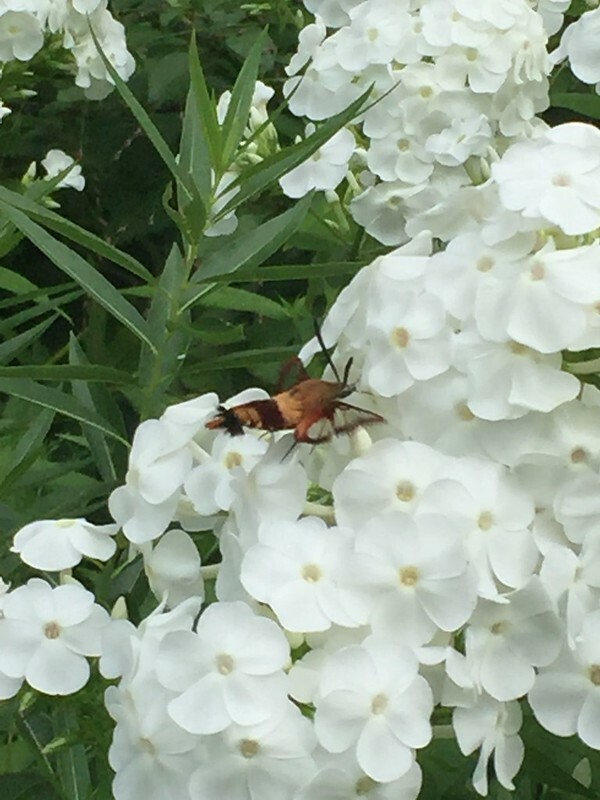 Consider the Pollinator Pathway Project, a collaboration between Cornell University and The Nature Conservancy through YardMap.org, an online citizen science community whereby gardeners can map their gardens including information such as location, specific plantings, green practices, aiding in the study of backyard sustainable habitat. The site also offers tips and advice on creating habitat. A stop along this pathway created by our local master gardeners, can be seen in the front yard of the Cornell Cooperative Extension in Watertown, NY. My own garden, in addition to my fellow master gardeners' gardens, is also registered on the pathway. Consider national, not-for-profit environmental education and advocacy organization Wild Ones: Native Plants, Natural Landscapes, whose mission is to promote environmentally sound landscaping practices to preserve biodiversity through the preservation, restoration and establishment of native plant communities. Learn more at WildOnes.org. 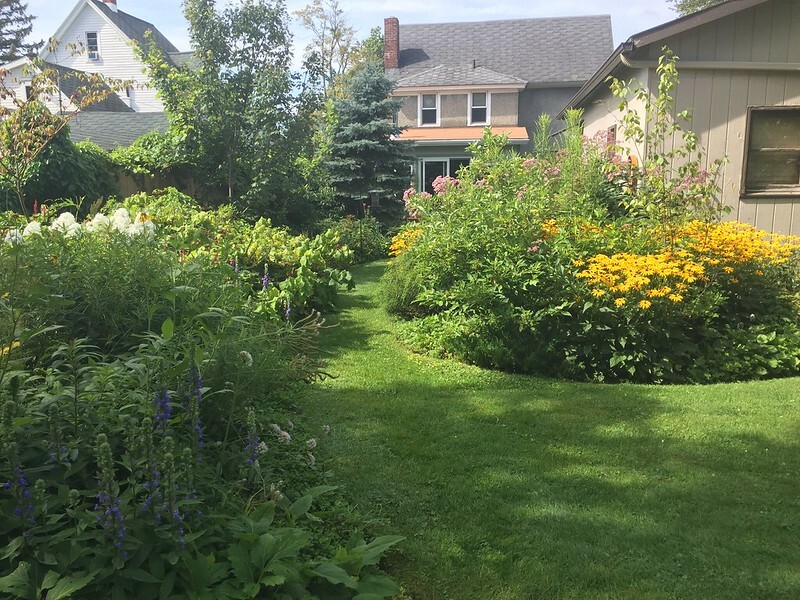 While native plants play an important role in the new garden, it isn't wrong to mix them among your favorites or establish a planting that grows well together or rather "design a plant community" as author Thomas Rainer might put it. What can you do to untame your garden and make it "new?" 1. Incorporate some native plants into your landscape. Native plants can be sourced online. PrairieMoonNursery.com and PrairieNursery.com are two great places to start. Amanda's Garden in Danville, NY outside of Rochester, and White Oak Nursery in Geneva, NY also offer mail order plants if you cannot make the drive. 2. Remove any invasive species from your landscape such as Barberry and Burning Bush. The Brooklyn Botanical Garden offers a guide, Native Alternatives to Invasive Plants as does Cornell, nysipm.cornell.edu. 3. Incorporate sustainable gardening practices: composting, leaving your leaves, water conservation, living mulches (groundcovers that replace mulch). 4. Learn to garden organically; do not use pesticides. 5. Design plant communities that are closely planted together. This reduces weeds and invasive plants taking hold, and also offers cover for wildlife. Imagine your yard as a series of islands for wildlife and connect those islands with safe "tunnels" of plants. 6. Plan for blooms spring through fall. Early spring daffodils will not feed newly emerging bees but the flowers of a native Serviceberry tree or shrub will. Joe Pye Weed and Goldenrod feed pollinators in late summer and fall. 7. Plant host plants (plants that feed the caterpillars of certain species, i.e. Milkweeds for Monarchs, Dill or Parsley for Black Swallowtail Butterflies). Learn more about host plants: nativeplantherald.prairienursery.com. 8. 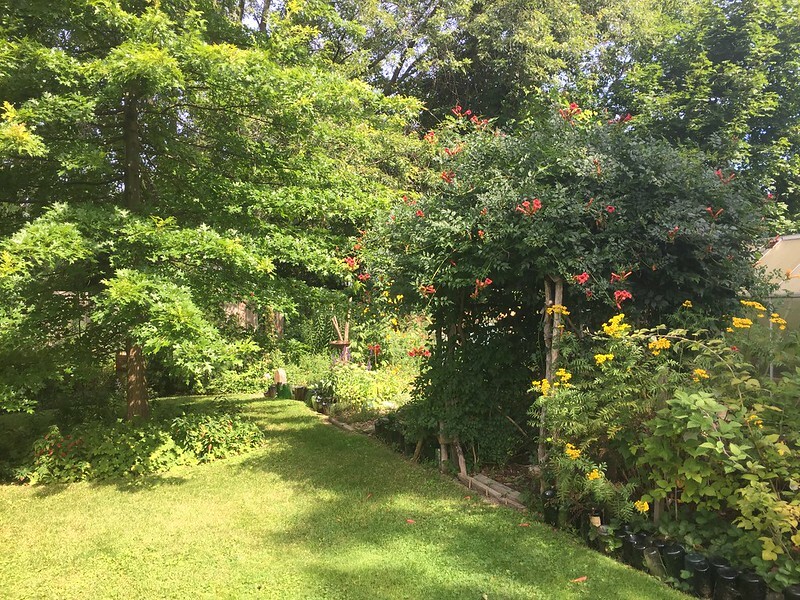 Garden in layers: tree, shrub/vine, perennial/woody plants, ground cover. This will create an overall rich, biodiverse landscape. 9. Save clean up for Spring. Many living organisms overwinter in leaf cover and in the stems of plants. Want fireflies next summer? Leave your leaves and woody stems! Many of our native solitary bees use plant stem nurseries. 10. Observe and learn. Taking note of the bees, butterflies, and birds in your landscape can be a wonderful learning experience. Begin a nature journal or join any of the citizen science projects out there such as Project Feeder Watch, Nest Watch, or The Great Sunflower Project.